Well, that’s what it took to recharge the batteries in the Pyrenees – part of a long-held ambition to walk the Spanish side of the mountains from Atlantic to the Mediterranean. … think 10,000+ ft. altitude and check the trees to get the scale. 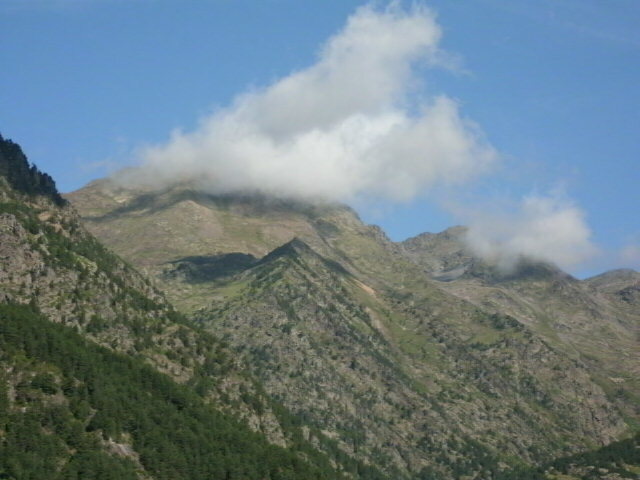 The mountain-with-cloud is one of the few parts of Andorra not devoted to removing money from visiting foreigners. Thanks to a quirk of geography I also visited the town of Llivia, a pocket handkerchief-size piece of Spain surrounded completely by France (Catalan required to read their web site). Eat your heart out Berwick-on-Tweed. Casting my eye away from the walking towards the Spanish media I was surprised to see their national RTVE 24h news channel live coverage of our own sordid tales of media hacking and the accompanying resignations/arrests. They even showed Rupert Murdoch being pied in the Commons Select Committee and Mrs M’s robust defence of the old fella. One of the more obscure issues the whole News International affair throws up for me is the almost complete inversion at national level of the normal relationship between local politicians and local print media. In my experience councillors (certainly those in a ruling group) often have a highly antagonistic view of their local morning and evening papers. Many are convinced the local rag is out to get them, that this hostility is peculiar to them and is uniquely bad in their patch. The truth of course is that this is what it’s like everywhere there’s a local daily paper. The difference nationally is that the stakes are so much higher – the government of a whole country, the power to determine the major strategic expansion of a global media company. The power (diminished in England now) to withhold a planning permission for a newspaper publisher isn’t quite the same thing.